Edmond Rostand doesn’t get an “official” credit for “story by” but anyone claiming familiarity with Cyrano de Bergerac will immediately recognize where screenwriter Lindsey Beer drew her inspiration. It’s not unusual for a modern-day, set-in-high-school romantic comedy to mine a classic for its inspiration. Shakespeare has written more than his share of these films and I’m sure there’s a Jane Austen to be found as well. As far as modern interpretations of Cyrano are concerned, this one’s not on the same level as Steve Martin’s Roxanne but it does some interesting things to bring the source material up-to-date (including pulling in the concept of “catfishing”). The overall package, despite suffering from some third-act narrative problems, generally goes down easily and boasts a strong, lived-in performance by Shannon Purser (Barbara from the first season of Stranger Things). 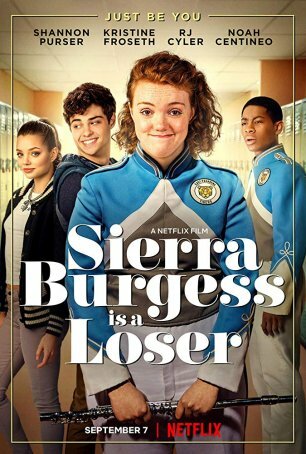 Although overall feel and thrust of Sierra Burgess is a Loser is ‘90s flavor rom-com material, the film does several unconventional things. The first and most obvious is the choice of Purser as the lead. In no way does she fit the norm for a female protagonist in this genre. Neither waif nor conventional beauty, she imbues Sierra with a likability as a result of her forthright personality and self-deprecating wit. Cyrano demands that one of the leads (normally, it’s the male one) not be a “pretty person.” After all, the whole point of the story is to highlight the superficiality of physical attractiveness. Beer’s script also finds a way to tie-in the so-called practice of catfishing into the story – a twist that Rostand might have approved had he lived in the digital age. Sierra is a bright, articulate high school student with aspirations of going to a top college (the optimism isn’t necessarily shared by her guidance counselor). Her best buddy and fellow marching band member defies genre norms – a guy named Dan (RJ Cyler) who is not gay (actually, his sexuality is never discussed nor is it important). Sierra has an ongoing feud with the school’s bitchy Queen Bee, Veronica (Kristine Froseth). The smarter and more physically imposing Sierra is no punching bag for Ms. Popularity and gives as good (or better) than she gets. Enter Jamey (Noah Centineo), the kind of hunk someone like Sierra could only dream about dating. When he approaches Veronica to ask for her information, she plays a trick and gives him Sierra’s phone number. Later than night, Sierra gets an unexpected message and, despite realizing it’s a mistake, she leads Jamey on, letting him think he’s interacting with Veronica. Lengthy text sessions turn into even longer phone calls. Then comes the dreaded moment: the video call. And, because Sierra has by now fallen head-over-heels for Jamey and doesn’t want their “thing” to end, she has no choice but to find a way to recruit Veronica to act as her avatar during the face-to-face meetings.